See more objects with the tag interior, decoration, allegory, home, dining, women, figurative, decorative, stylized, eating, wood. See more objects with the color sienna dimgrey peru darkolivegreen or see all the colors for this object. This is a Knife. It is dated ca. 1700 and we acquired it in 1985. Its medium is cut and honed steel, carved wood, cut sheet brass. It is a part of the Product Design and Decorative Arts department. 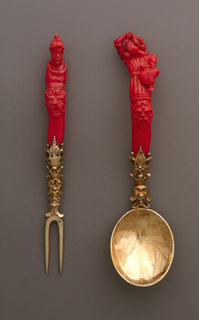 The carved wooden handle of this fork has a figure of St. George on a horse slaying the dragon. 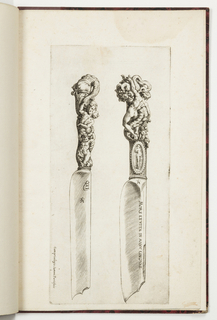 The knife has figures of the female virtues Faith, Hope and Charity, each holding their attributes. The shank of a knife wrought from steel is sharp and needs to be encased in some other organic substance. There was an established Northern tradition of wood utensils, particularly for those who could not afford more luxurious materials, such as ivory or horn. The blade of this scimitar-shaped knife reflects the great changes the utensil underwent during the seventeenth century. Knives went from being double-bladed to having a single cutting edge and a rounded, unthreatening tip. This occurred in response to the rising popularity of the fork. The fork has two long, widely separated tines, making it useful for stabilizing meat while cutting and for conveying large pieces to the mouth. Previously, one would eat with the hands or use a sharply pointed knife to spear food for eating. This practice began to be regarded as uncivilized in the seventeenth century and forks were increasingly produced with multiple short, closely-spaced tines in order to hold smaller morsels of food.